Bu çalışmanın amacı, öğretmen adayları tarafından gerçek sınıf ortamında gerçekleştirilen etkinliklerin yapılandırmacı yaklaşıma uygunluğunu belirlemektir. Çalışma, bir eğitim fakültesinde Hayat Bilgisi ve Sosyal Bilgiler Öğretimi derslerini alan 3. sınıf öğrencileri ile gerçekleştirilmiştir. Öğretmen adaylarının sınıf içi uygulamaları 5E modeline uygunluk açısından değerlendirilmiştir. Öğretmen adaylarının bu model aşamaları arasından en çok açıklama aşamasına uygun olan davranışlara yöneldikleri gözlenmiştir. Bunun yanı sıra 5E modelinin en önemli aşamalarından biri olan bilgiyi derinleştirme aşamasına ilişkin davranışlar en az gözlenmiştir. The purpose of this study is to determine the relevance of activities applied by prospective teachers, in a real classroom setting, to the constructivist approach. The study sample consists of third year students taking Life Studies and Social Studies Teaching courses at a faculty of education in Turkey. Among the 5E learning model cycles, prospective teachers mostly exhibited behaviours associated with “the explanation” cycle. It is thought-provoking that the elaboration cycle, considered one of the most important of the 5E learning cycles, was among the least observed. yapılandırmacılık, 5e modeli, öğretmen adayı, hayat bilgisi öğretimi, sosyal bilgiler öğretimi. Al Majali, Y.D.S. (2013). The Impact of (5Es) learning cycle on the outcome and the development of creative thinking among students of seventh grade in Arabic language course in Alqaser/ karak brigade. International Journal of Academic Research, 5(5), 31-40. Atasoy, B. (2004). Teaching and Learning of Science Education [Fen Eğitiminde Öğretme ve Öğrenme]. Ankara: Asil Yayıncılık. Aydın, N. & Yılmaz, A. (2010). The impact of constructivist approach to meta cognitive skills of students. [Yapılandırmacı yaklaşımın öğrencilerin üst düzey bilişsel becerilerine etkisi]. Hacettepe University Journal of Education, 39, 57-68. Aykaç, N. & Ulubey, O. (2012). Pre-service teachers’ opinions about the application level of elementary school program. [Öğretmen adaylarının ilköğretim proramının uygulanma düzeyine ilişkin görüşleri]. Ankara Üniversitesi Eğitim Bilimleri Fakültesi Dergisi, 45(1), 63-82. Brooks,J. G. & Brooks, M. G. (1993). The Case for The Constructivist Classroom. Newyork: ASCD. Brooks, J. G. & Brooks, M. G. (1999). In Search of Understanding: The Case for Constructivist Classrooms. Alexandria, VA: Association for the Supervision and Curriculum Development. Dikici, A., Türker, H.H. & Özdemir, G. (2010). The impact of 5e learning cycle to meaningful learning. Journal of Education Faculty of Cukurova University 39, 100-128. Doğanay, A. & Tok, S. (2007). Contemporary Approaches for Teaching. In A. Doğanay (Eds. ), In Methods and Principle of Learning. Ankara: Pegema Yayıncılık. Ev, H. (2006). Active learning and approaches of measurement and assessment.Paper presented at the Symposium of Seeking New Paradigm in Turkish Education System (November 5-6), Turkey: Ankara. Fensham, P.J., Gunstone, R. & White, R. (1994). Science Content and Constructivist Views of Learning and Teaching. In P.J. Fensham, R. Gunstone & R. White (Eds. ), In the content of science: A constructivist approach to its teaching and learning (pp. 147-160). London: The Falmer Press. Gelbal, S. & Kelecioğlu H. (2007). Teachers’ proficiency perceptions of about the measurement and evaluation techniques and the problems they confront. 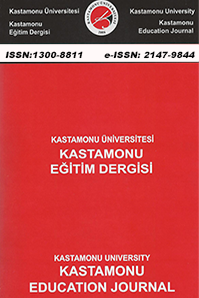 Hacettepe University Journal of Education, 33, 135-145. Gould, J.S. (2007). Dil becerilerinin öğrenimi ve öğretimine oluşturmacı bir perspektif. [A constructive perspective to learning and teaching of language skills]. In Fosnot, C.T. (Ed. ), Durmuş, S. Translated by Yapılandırmacılıkta Teori, Perspektifler ve Uygulama. Ankara: Nobel Yayın–Dağıtım. Kaya, N. (2013). The attitude of class teachers to constructivism and self-efficacy belief on constructivist practices (Afyonkarahisar sample). [Sınıf öğretmenlerinin yapılandırmacılığa ilişkin tutumu ve yapılandırmacı uygulamalara ilişkin öz yeterlik inancı: Afyonkarahisar örneği]. (Unpublished master thesis), Afyonkocatepe University, Afyonkarahisar. Lawson, A.E., Abraham, M.R. & Renner, J.W. (1989). A theory of instruction: Using the learning cycle to teach science concepts and thinking skills. National Association for Rese- arch in Science Teaching, College of Education, University of Cincinnati, Cincin- nati, OH45221.Retrieved from http://files.eric.ed.gov/fulltext/ED324204.pdf (ED324204). M.R. (1997). Introductory comments on philosophy and constructivism in science education. Science and Education, 6(1-2), 5-14. Metin, M. & Özmen, H. (2009). Difficulties of pre-service teachers in developing and implementing teaching activities based on 5e model in constructivist approach. [Yapılandırmacı yaklaşımda 5e modeline dayalı etkinliklerin geliştirilmesi ve uygulanmasında öğretmen adaylarının karşılastığı zorluklar]. Necatibey Faculty of Education Electronic Journal of Science and Mathematics Education 3(2), 94-123. Öz, F. (2006). Practical with Turkish Teaching-Improved According to the New Curriculum. [Yeni Programa Göre Geliştirilmiş Uygulamalı Türkçe Öğretimi]. Ankara: Anı Yayıncılık. Pınar, M. A. (2013). The views of science and technology teachers toward classroom practices of constructivist approach (Diyarbakir sample). [Yapılandırmacı yaklaşımın sınıf uygulamalarına ilişkin Fen ve Teknoloji öğretmenlerinin görüşleri: Diyarbakır örneği]. (Unpublished master thesis), Mus Alparslan University, Mus. Rainer, J., Guyton, E. & Bowen, C. (2000). Constructivist pedagogy in primary classrooms. Paper presented at the Annual Conference of the American Educational Research Association, USA: New Orleans, LA, (April 24-28). Retrieved fromhttp://files.eric.ed.gov/fulltext/ED440760.pdf (ED 440 760). Richardson V. (1997). Constructivist Teacher Education. New York: Falmer Press. Savaşçı, F. & Berlin, F. D. (2012). Science teacher beliefs and classroom practice related to constructivism in different school settings. Journal of Science Teacher Education,23 (1), 65-86. doi: 10.1007/s10972-011-9262-z. Schunk, H.D. (2004). Learning Theories: An Educational Perspectives. (4th edition). New Jersey: Pearson Prentice Hall. Settlagh, J. (2000). Understanding the learning cycle: Influences on abilities to embrace the approach by preservice elementary school teachers. Science Education, 84, 43–50. Simpson, L. T. (2002). Dare I oppose constructivist theory?. The Educational Forum, 66, 633-662. doi: 10.1080/00131720208984854. Tanner, K. D. (2010). Order matters: Using the 5e model to align teaching with how people learn. CBE Life Science Education, 9(3),159-164. doi: 10.1187/cbe.10-06-0082. Tsai, C.C. (1998). Science learning and constructivism. Curriculum and Teaching, 13,31-52. Ün Açıkgöz, K. (2005). Effective Teaching and Learning. [Etkili Öğretme ve Öğrenme]. İzmir: Eğitim Dünyası. Vermette, P., Foote, C., Bird, C., Mesibov, D., Harris-Ewing, S. & Battaglia, C. (2001). Understanding constructivism(s): a primer for parents and school board members.Education, 122(1), 87. Wilder, M. & Shuttleworth, P. (2005). 5E learning cycle lesson. Science Activities, 41 (1), 25-31. doi: 10.3200/SATS.41.4.37-43. Wilson, B.G. (1996). Constructivist Learning Environments: Case Studies in Instructional Design. New Jersey: Educational Technology Publications. ISNAD DEMİRHAN İŞCAN, Canay , KELEŞOĞLU, Serkan . "Öğretmen Adaylarının Yapılandırmacı Yaklaşımı Temel Alan Uygulamaları". Kastamonu Eğitim Dergisi 25 / 3 (May 2017): 1055-1070.